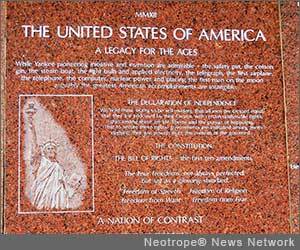 FELICITY, Calif. /California Newswire/ — Appropriately on Washington's Birthday, Feb. 22, 2013, at 10:45 a.m. PST, the Museum of History in Granite is having the first and only preview for the press of the 100-foot granite "History of the United States of America" monument. Ambassador Jean-Marie Daillet of France, former representative to NATO, will be among a few foreign guests. Jay Stokes, President of the United States Parachute Association and parachute instructor for the SEALs will bring the U.S. flag by parachute at 11 a.m. PST. A USMC color guard will start the brief festivities. There will be no speeches, only a 15 minute question and answer session with the founder and editor, followed by a rustic collation. Monuments have a finite end, yet history goes on. How has the museum coped with this matter? We are part of our era and culture. Is the past represented objectively? Will these summaries prove valid in one hundred years; 500; 1,000? The museum logo includes the words "Literacy for Millennia." Direct mind-to-computer communication is already experimental. What is the future of literacy? For the media, on Friday, February 22, 2013, 10:45 a.m. PST, the Museum of History in Granite is having the press preview of the 100-foot granite "History of the United States of America" monument. You are cordially invited to attend. The formal Dedication of the monument will take place with pomp and circumstance on Washington's next birthday Saturday, February 22, 2014. The President has been invited; hence there will be a speech or two. The Museum of History in Granite is located at Center of the World Plaza, Felicity, CA 92283-7777. Directions: www.historyingranite.org. The museum does not advertise and is not yet well known. It has been praised in writing by a Supreme Court Justice, the President of an Ivy League University, two Commandants of the Marine Corps and among other notables, the founder of Vanguard. As part of some school programs, visiting students select a subject of interest, usually from the "History of Humanity" monuments, and then take tracings of sentences for a school essay. This fulfills an educational aim of the museum: "The purest form of education may be a self-directed search for knowledge. The Museum, in summarizing vast subjects, provokes and encourages such efforts." While focused on history, the museum has inadvertently also become an art museum with over 450 etchings in granite. For information: Ms. Lee 760-572-0100 and www.historyingranite.org .